In the Spring 2010 issue of Response, I encouraged readers to watch director Laurent Cantet’s recent Cannes-award-winning film The Class. 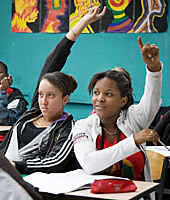 The film, based on François Bégaudeau’s autobiographical book Entre les Murs, focuses on a French high school teacher named Mr. Marin and his culturally diverse students. I also arranged to show The Class to Michelle Beauclair, associate professor of French at Seattle Pacific University, and Andrea Taylor-Brochet, an adjunct professor of French at SPU. Beauclair was interested in considering the film through the lens of her own experience teaching in the French school system for a year. Taylor-Brochet taught there as well, and her children grew up in the French school system. The film, which they watched in an SPU campus conference room, sparked a lively discussion about Mr. Marin’s leadership in the classroom. I asked them if they were persuaded by what they’d seen, and if the scenarios in the film seemed lifelike, based on their experiences. They both responded that it felt like “the real thing” — that Mr. Marin was a believable man in a believable situation. “We have a tendency in [American] films and stories to show these exemplary characters,” said Beauclair. “With solutions that are just delivered,” Taylor-Brochet agreed. It’s true. Mr. Marin is faced with rowdy, disobedient, and disrespectful students, and we see him pushed to the limits of his patience. In one particularly explosive scene, he uses an inappropriate term to describe two of the young women in the classroom. Suddenly, he’s defending his actions to the students and to the school principal. I asked Beauclair and Brochet-Taylor what they thought of Marin’s teaching style. Were Marin’s troubles representative of troubles facing French teachers? Taylor-Brochet found the movie’s depiction very true to her own experience. So she sympathized with the challenges facing teachers like Marin. “They have to deliver something academic, but … it’s so challenging. These students have created this huge gap between the teacher and themselves, and he’s trying to bridge that gap constantly.” She saw him as a paradox. He can be “shocked and outraged by the behavior of the students,” but when he speaks with other teachers and the principal, he becomes an advocate for the students, defending them and looking out for their best interests. I asked them if they felt that The Class was dispiriting. Does it leave us with much hope? Perhaps that is why films like The Class are so necessary. They give a compelling picture of challenges that today’s students, parents, teachers, and school board leaders are facing in culturally diverse classrooms. Such diversity can be a wonderful thing, but it challenges instructors and administrators to become familiar with their students’ varying cultural sensitivities, their family dynamics, their traditions, and the pressures they face beyond the classroom. Unlike so many sentimental, simplistic films about classroom inspiration, The Class gives us an uncompromising portrait of the courage, conviction, and resilience required to make classroom time rewarding. Hopefully, it will spark further discussions about how to meet those challenges. What’s your favorite film about a leader who’s inspirational and transformational?